RACHELLE: So you made Aliyah… What kind of work do you do now? KALEY: I raise money as the Developmental Director for the Israel Free Loan Association (IFLA). The organization was started in 1990 and has since provided 57,000 interest free loans – which equals about $250 million. One of the great things about the organization is that someone’s donation always gets recycled. Once a loan is repaid, the money is used to help another family. It allows the number of people we can help to multiply quickly. What’s exciting for me – and I’ve only been in Israel less than a year and a half – is that I feel blessed because I can use my skill set to help Israelis. As a new olah (immigrant to Israel), I see how challenging it is with the economy and how many problems there are in the financial sector that stop the country from expanding. It’s amazing to be affecting change, and it gives me a sense of purpose in making Aliyah. I always felt Israel was home, but you never know what’s actually going to happen when you make Aliyah. 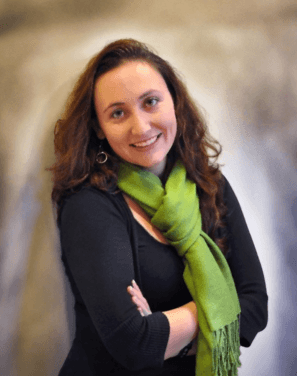 RACHELLE: How did you get involved with IFLA? KALEY: I was never really interested in the financial sector until I moved to Israel and saw how broken the system is. I was working for a different organization and giving a talk at Nefesh B’nefesh when a woman in the crowd approached me. She said IFLA was looking for someone. I went to learn about it and it sounded interesting. And that’s how I got involved. RACHELLE: You mentioned your talk at Nefesh B’nefesh. What was your involvement with Nefesh B’nefesh? 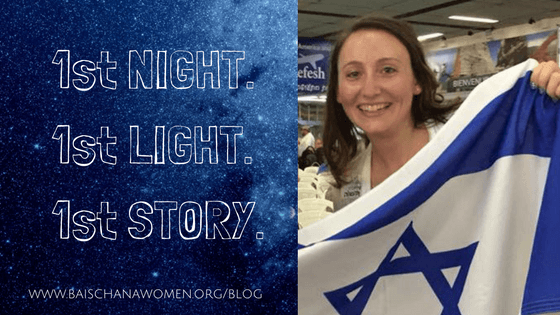 KALEY: When I first got to Israel, I sort of became the Aliyah poster child. Before I even got on the plane they did an interview with me that played on the radio during our flight over. 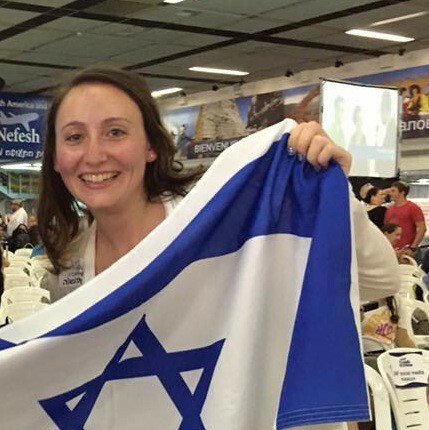 I left America on a charter flight – which means the whole flight leaving from JFK was filled with people making Aliyah – and I had an Israeli flag with me. When the ceremony started, I wrapped the flag around myself, and the photographers all started taking pictures of me. Once they realized I speak Hebrew they interviewed me. 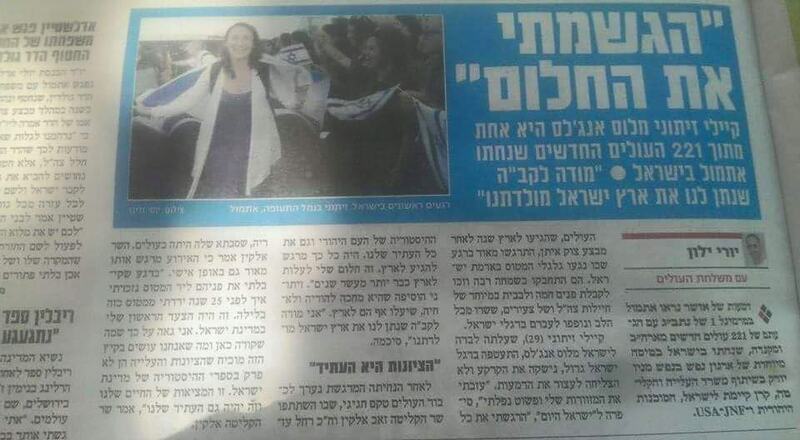 I was in an Israeli newspaper called Israel Hayom and on the news with a Channel 2 news castor. RACHELLE: Where are you from and how did you end up making aliyah? KALEY: I’m from LA. I’ve wanted to make Aliyah since I was a little girl. When I came to seminary in Israel, I realized this is Home. But I was already enrolled in USC, so I ended up going back and then went to Pepperdine to finish my masters degree. I would say that what’s really exciting about my job is that with the fires in November – there were 600 fires in 6 days. A lot of times we see things like that and wonder, “What can we do? How can we help?” And I was in a position to actually help. IFLA started emergency loans to help people in dire situations from the fires. Usually people have to apply and get two guarantors, but we relaxed the criteria so it’s easier to get a loan. People who really need the help don’t have to jump through hoops to get it. We always try to make it easy for those in need to benefit from us before going to the bank and paying high interest. RACHELLE: Aside from relaxing the loan application criteria, were there other ways that you helped the fire victims? KALEY: Yes. To support the emergency fire loans we also ran a crowdfunding fundraiser and in 2 weeks we raised $50,000 dollars. On top of that we had 2 matchers who brought our total up to $90K. It’s amazing to have something tangible that I can do right now. I don’t have to wait and see who could help or find out which organizations are doing something – I could just jump right in. RACHELLE: Wow. I know that you also helped orchestrate clothing donations for the fire victims… Can you tell me about that? KALEY: With the fires, there was also an organization called Keep Olim in Israel that arranged for the donation of goods. They asked a bunch of olim to act as drop off centers around the country, so my house was one of them. My neighbors, my roommate and me. 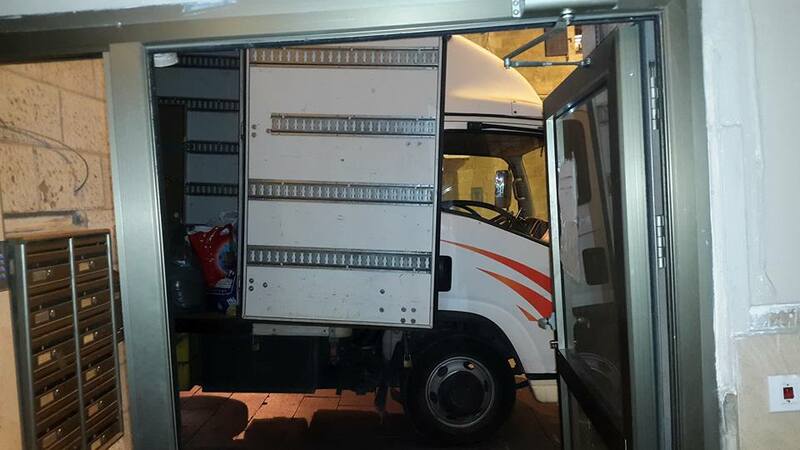 We had people coming from all over Jerusalem, dropping things off until our living room was full. One day a huge moving truck came and picked everything up. It drove around picking up from all the other drop off locations around the country. It’s really amazing because I haven’t been here that long, but I feel like a part of the country when I can contribute that way. RACHELLE: Why do so many families in Israel struggle financially, and what can Americans do about it? KALEY: There’s a culture of Financial Exclusion here. For example, there are fees for every action you take at the bank. If you are a low income Israeli who can’t make ends meet, then you can’t afford to pay those fees. Avoiding fees means avoiding the bank altogether which eliminates someone’s access to other financial tools and access to capital. Things that could one day help that person stabilize or even save. There’s also a culture of taking loans. Banks push loans, but the lower a person’s income, the more high risk they’re considered, so their loans have higher interest rates. So many people take a loan to pay off a loan and go further and further into debt. It’s disastrous. What can Americans do? Engage in smart philanthropy. Americans are always looking to give to Israel. It’s not a question of are we going to give people money, but rather let’s create financial inclusion. Teach them financial tools and help people budget. We need to make this part of Israeli society. Another thing I would say is it’s so important for people thinking of making Aliyah, is that olim need to bring their own skills and tools to Israel. They need to use them here. You can’t come expecting the government to take care of you. You need to help the country grow. We can help this society grow and mature to overcome some of these obstacles. KALEY: I want to say something about Bais Chana. I personally went through a really difficult experience recently. My boyfriend David died. And one of the girls that I met at Snorkel & Study, Ani, has been an immense support throughout this experience. She was available any time of day. We would talk about Chassidus, Tanya, what his soul’s journey is like now, the afterlife. Just the whole process. Why are our souls here now? And it’s really an immense blessing to have that context during this experience. Other people from the program also reached out and that’s one of the really beautiful things. David loved this daily Tanya text that we got from Ani. He and I started getting daily texts, and we would talk about it regularly. So when people were looking for what they could do in his honor, in his memory, it was perfect. This was something that was so meaningful to him. I posted it on facebook and shared with people so that they could join this group and elevate his soul. It’s been a very difficult experience but something like this brings light. And I see the different parts of my life coming together.